The HOC2 GLIDE is finally here. Hands on Concepts 2 announces the release of the next generation bi-ski, the HOC2 Glide. The industries first production Bi-Ski with a self loading system and suspension At HOC2 our approach is very simple, we listen to our clients and do our best to provide innovative, state-of-the-art, solid solutions to their requests. When adaptive skiers and programs asked us for an improved Bi-Ski, HOC2 listened and responded. As a result, we created an exceptionally well skiing unit with the features you have been asking for. • Assisted Self-Loading System - Enables Bi-Skier to self-load with confidence and ease. If your bi-skier needs assistance a volunteer can engage the load system with just one hand and safely prepare for loading the chairlift with ease. The system can be dialed in for the occupant’s weight via our simple interchangeable gas springs. For the independent bi-skier, this enables them to have the right amount of assist and know they are dialed in for a safe and simple load and off-load every time. For your instructors and volunteers it means a lifting less weight. • 22 inch load height – Our system brings the loading clearance to 22 inches above the snow while holding up to 225 pounds in the load position. No more hoping you make it, no more needing two people to lift the unit onto the chairlift, and no more wasting time pumping like you are changing a car tire. • 4 inches of active suspension - This makes for a truly great ride down the mountain. No more spine jarring “hits”. Now the skier can ski longer and end the day with less fatigued and in less pain. • Hand- Chromoly frame, CNC components all engineered and built for durability and longevity. • Lower roll-center - Because we started from scratch and designed our own articulating foot, we were able to lower the units roll-center. Doing this creates a smoother side to side transition while skiing. No more “roll flop”. • Adjustable Ergonomic Seating - A completely adjustable back with a ratcheting system, allows for a comfortable seating position on the chairlift and the ability to quickly and consistently adjust the seat back into the skiers desired skiing position. • Co-Poly clamshell bucket seat – Co-Poly has proven to be the material of choice for cold and abusive environments. Our two-part seats are Thermoformed over aluminum tooling producing a consistent product that will last. • State of the art Snow skis - We use parabolic shaped skis with edges that complement each other instead of working against each other. This makes for a more responsive unit and better performance while skiing. 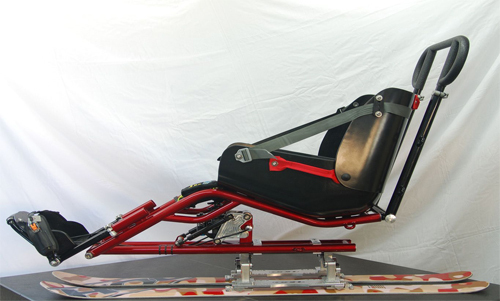 • Snow-ski Hand built in the USA - Because they can maintain HOC2’s demanding standards, Coda Boards in Ridgecrest CA. was chosen as HOC2’s snow-ski manufacturer. The skis for our Bi-Ski are treated no differently than any of our performance snow-skis for mono skiing. They are constructed using the same high quality material composition and lay-up procedures, as is the entire HOC2 Quiver. This produces a ski that is better performing and longer lasting. • Integrated System - CNC located threaded inserts in the skis core mate to HOC2’s “Floating Base Plate System” create an Integrated system. This makes the interface between the HOC2 Glide and the snows ski stronger and therefore will last longer. This also allows for other skis to be easily mounted to this unit. • Stronger by design - Our skis use a ½ inch wood core, not a 3/8 wood core and not foam. This starts the unit off on the right foot, so to speak, with a snow ski of advanced construction and shape which maximizes the skiing experience, while minimizing damage and breakage caused by short loads and off-loads. • Increases valuable ski time - Less impact on the bi-skier themselves and much less lifting by instructors and volunteers can only lead to a better time on the hill! Save your instructors & volunteers backs and let the HOC2 Glide do the heavy lifting for you. Simply put, HOC2 was able to package the features you have been asking for. With four inches of suspension travel and an assisted loading system the HOC2 Glide is the most advanced production Bi-Ski on the market today. Combined with a lower roll center, our “Floating Base Plate System”, and parabolic skis. HOC2 has again listened, and designed the product you have been waiting for. Thanks to your input, the HOC2 Glide out performs the competition hands-down.